In fiction: Bob wants fight the zombies, but they are all former friends. Is Bob avoiding this conflict because he hopes one day there will be a cure? Is Bob feeling guilty that he may have been the cause of their zombifcation? Bob is in conflict with himself. In fiction: What keeps Bob from getting what he wants? Is it another character, like Mary for instance? Does Mary want this zombie trophy too? That would create an obvious conflict where two people want the same thing. That’s easy enough, as long as we know why Mary also wants this trophy, since the other character can’t just be an empty archetype (eg, a villain from central casting). Bob is in conflict with another human. In fiction: What if the weather prevents Bob from getting his trophy? The weather has no motivation. The weather is based in science, which makes Bob’s conflict less personal, compared to the conflict with Mary. Nature makes a really good foil to Bob, since Bob will probably try to personify the nature of nature. He may shout into the hurricane, but the hurricane ain’t gonna care. Still, the weather is a conflict that prevents Bob from reaching his goal. Zombies, although unnatural, can be considered a force of nature. Hence, Bob can have multiple forms of nature conflict, all of which are apathetic to Bob’s goals. In fiction: Is society really behind Bob? What if the zombie apocalypse was a weapon against societal enemies or some other scenario? Bob doesn’t just need to survive, he must also convince society that he’s doing the right thing. Bob is in conflict with society. Once you’ve defined the characters (Bob, Mary, etc. ), you must give them a conflict. This begins the story. But marketing isn’t fiction, at least it’s not supposed to be. 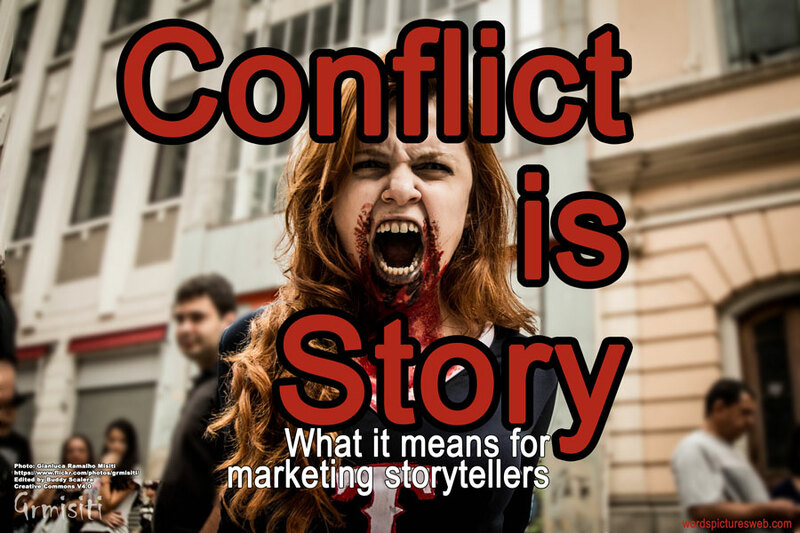 That begs the question: What’s the conflict in marketing storytelling? This gets a little tricky, since many marketers think The Story is “we’re pretty wonderful, buy our stuff.” That’s not a very compelling story outside of the company. It’s more like a brand selfie. It helps to think of your marketing story through the eyes of the user. What conflict does the user have and how does your brand become part of their narrative? This changes the point of view (POV) of the conflict and resolution. If you work in content marketing or content strategy, you must guide your team to fully embrace the POV of the target user, not just deliver a brand message. Great storytellers don’t talk at people, they engage them. Your brand isn’t likely to be the star of anyone’s personal story because their story is defined by their own narrative and complicated by their own conflicts. In certain cases, however, your brand can be a solution to the personal conflicts of your customers. Yes, your brand can be the turning point in the story that helps the hero (your customer) arrive at a satisfying conclusion. The best way to do this is to understand your target customer. You must know them like the characters you write in a fiction story. You must understand what they want, what motivates them, and what creates a conflict for them. If you were creating a fictional character, you’d work on a background bio to understand that character’s personal history and how it shaped their wants, needs, and desires. In marketing, you might create a detailed persona, which would help define your target customer’s wants, needs, desires. Ultimately, you want to understand “target users” and “fictional characters” as real humans with actual needs. If your brand team is trying to create a brand story without a full understanding of your customer needs, you may not actually have a story. You probably just have the setup for a story. It’s time to dig deeper. Let’s go back to Bob, our futuristic zombie slayer. If your brand helped Bob solve his conflict(s), you’d be a solution. If you call your brand a solution, reverse the POV to determine if you’re solving someone’s problem or if you’re taking a brand selfie. If you can map a scenario where you really, truly, actually solve someone’s conflict then, yes, you are a solution. As you go through this story mapping process, you’ll know what your user needs at any point in their user journey and what role your brand can play. Tell THAT story. From an app to an immersive experience to a simple infographic, your users need something from you. Understanding what this is will help you deliver the right message and the right time in the right place because they are looking for answers. And, if you’ve done your job right, you’re brand will be at last part of that answer. If you’re in the business of marketing, you’re in the business of storytelling. You just need to remember who the story belongs to, what the role you play in that narrative, and how to respond to the inevitable zombie apocalypse. Conflict is story. Graphic by Buddy Scalera based on a photo by Gianluca Ramalho Misiti. 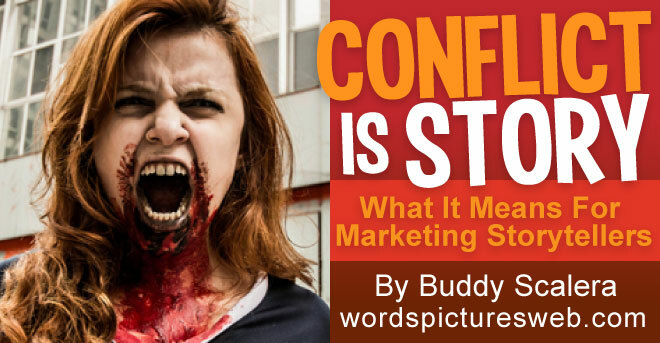 This entry was posted in content strategy, fun stuff, Marketing, Story and tagged conflict, story, storytelling, zombies by Buddy_Scalera. Bookmark the permalink.